Now available in Kindle and on Paperback. Caitlin Star was once a beaten down but fiery thirteen year-old orphan trained by Gunner Star in the ways of the Bull Mongoni—a mythic species of ancient hominids. Caitlin fought in the Stadium Games and became the leader of a revolution that defeated fascism in the culture civil wars of North America in the days before the apocalypse. But those days of training, Stadium Games with fights to the death, and revolutions, were a long time ago. Now the Bull Mongoni are not mythic. They are real and living in the Congo rain forest with Caitlin and her human, chimpanzee and gorilla friends. And for the past several years, Caitlin has been less of a warrior and more of a stateswoman as she and her friends have worked hard to build a new world—one of peace where both they and the Earth itself could finally heal from all of the trauma of the past decade. But across the Atlantic a new evil has been brewing in the tattered remnants of America. An evil that has other plans. An evil being stoked and inspired by an orange-faced ex-TV reality star conman named Mack and his cult leader sidekick Frank Aries, a sadistic religious psychopath who is known as the Hand of God. 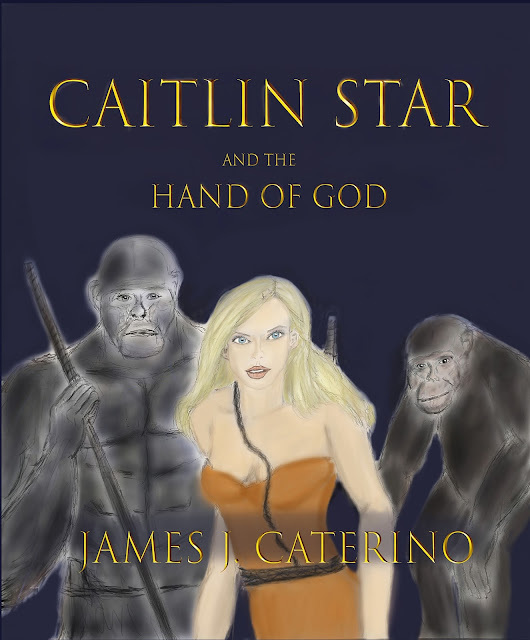 “Caitlin Star and the Hand of God” is a smashing, stand-alone sequel to “Caitlin Star: The Trilogy” from neo-pulp master storyteller James J. Caterino.